Btw E9th St & West Mall Drive May 18 – May 25 Superior Ave. A lane will be maintained for parking garage access between E. 9th & E. 6th Streets. Btw Superior & Euclid Aves May 20 Intermittent traffic control A lane will be maintained for access to the 515 Euclid garage. Garages Vincent Ave. have access via E. 9th St. Between St. Clair & Lakeside Aves May 23 E. 9th St. Access to parking garages will be maintained. Btw E9th St & East Mall Drive May 23 Intermittent traffic control Access to parking garages will be maintained. Btw E6th & E18th St May 24 -25 Superior Ave. Buses will be re-routed to Prospect. Btw Euclid & Bolivar Aves May 24 -25 E. 18th St.
Btw Ontario & E18th St May 24 -25 Open for car traffic No parking on this street to allow for the rerouting of buses from Euclid Avenue. 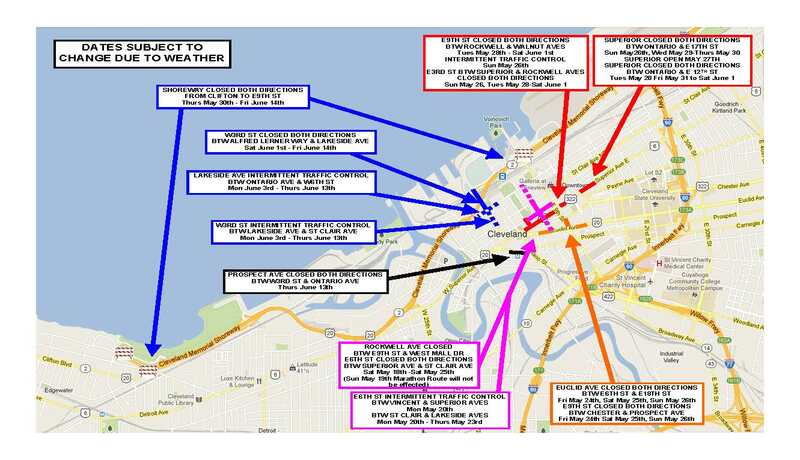 Between Lake Ave & E 9th St May 30 – June 14 Detroit Ave. Edgewater Park and the marinas north of the Shoreway will be accessed via West 49th St. Detroit Ave btw West Blvd & W25th St will be no parking rush hours to expedite traffic flow. Btw Alfred Lerner Way & Lakeside Ave May 30 – June 14 E. 9th St. Access to Huntington Garage will be maintained off of Lakeside Ave.
Btw W6th St & Ontario Ave June 13 Intermittent traffic control Parking garage access will be maintained. Btw Rocky River Dr & Story Rd June 14th Hilliard Blvd Emergency Ambulance Access will be maintained.